Summary: Samsung shows us the X360 Notebook, and explains how this is the lightest model to ever hit the market. 16:13 We’re welcomed and told that topic today is Lighter than Air. I know it’s a notebook, so I’m guessing it’s going to be pretty portable. 16:19 We get a video to watch! Woo hoo! Smiling women pose in front of computers and go skiing. Next we see a machine tapping away at a keyboard and a close up of the bullseye in archery. Clearly this means the new laptop is a death defying machine which can do many things; I’m thinking a multitasking processor? 16:20 HS Kim, Executive Vice-President joins us to fill us in on the latest developments. He says Samsung are aiming for 250% rise in sales this year, and thinks they’ll get this due to their commitment and drive. Apparently their success is bound up in the ‘core technology’ they use, which ‘constantly challenges the market’. He’s not giving anything away though, but perhaps his colleague John from Microsoft will. 16:21 John Mangelaars from Microsoft tells us how good it is to be a consumer as today we get to define what technology providers will build. Still no word on what the Notebook does, but he says the list ‘is endless’. Social networking is also mentioned, but thankfully the F-word hasn’t been used yet (Facebook). Since consumers can easily pick and choose between products, this drives Samsung to create something user friendly, with all the specs demanding consumers want. He sounds very enthusiastic, so I’m hoping it will be good. 16:24 We’re asked to imagine a mobile phone, which uploads automatically to the Internet and also syncs to your home PC. Wouldn’t that be great? Not sure where he’s going with this. 16:27 What is a brand asks Patrick Povel, Samsung product manager. A Louis Vuitton bag, a Porsche? Or a Starbucks latte? I’m sure he’ll get to the point soon. Ahh, here it is. He says they’re the world’s biggest brand in electronics and No1 in Business Week Magazine, and then he asks (rhetorically) what that means to the customer. What are customers looking for? Great performance; he says that whether or not they need it, they want it, and you have to provide it for them. They want something with multi-functions, a lovely design and something easy to use. Sounds good so far. And last, but but not least, he says is that they want a light portable product. 16:31. We’re told they’re better than their competitors as most parts in their Notebooks are made by Samsung- HD players, hard drive, keyboards, components…They’re so focused on quality that they just use their own products and have their own research and development centres, with 2 dedicated just to Notebooks. 16:35: He starts telling us all the awards they’ve won, which include reliability and servicing. And then he mentions how they’ve come 4th in a survey for customer loyalty. Kudos to them. 16:36 Video number two. American models tell us what they want from a laptop. Light seems to be the key word here, then latest tech and USB ports. We get to see the models/spokespeople/ so called everyday people in black and white, so they look all arty and intense. 16:49 Two models wearing white reveal 3 light laptops. Quelle surprise! But what are the features of the new laptop titled, the X360? 16:40 We’re taken through the ten key areas of the new laptop. Firstly it only weighs 1.27kg, including the battery and solid state drive. The battery life is calculated at 10 hours, which is extremely impressive (and would come in useful here) A 6 cell will give you 10 hours and a 9 cell will give you up to 13! 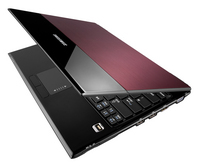 It includes the latest Intel Centrino 2 Duo ULV processor, and has a backlit LED 13.3 inch screen that is 3mm thick. Add to that a 128GB Solid State Drive, and a finger print scanner and TPM module for extra security. It has an integrated 7 in 1 card reader, 3 USB ports and VGA/HDMI ports. It’s also compatible with their new docking station the P-Dock which adds 5 more USB ports and is an easy way to charge the device. 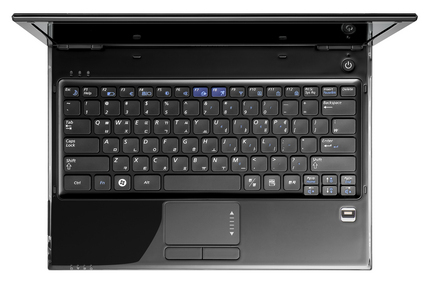 The laptop is encased in a magnesium aluminium alloy to make it robust and has an aluminium plate on the LCD back. It’s available in three colours, red, black and grey. The keyboard is coated with silver nano powder that makes it antibacterial, which means less nasties getting into your system. 16:49 Video number 3! We get to see close-ups of the new laptop with shiny bubbles around it for added glamour.